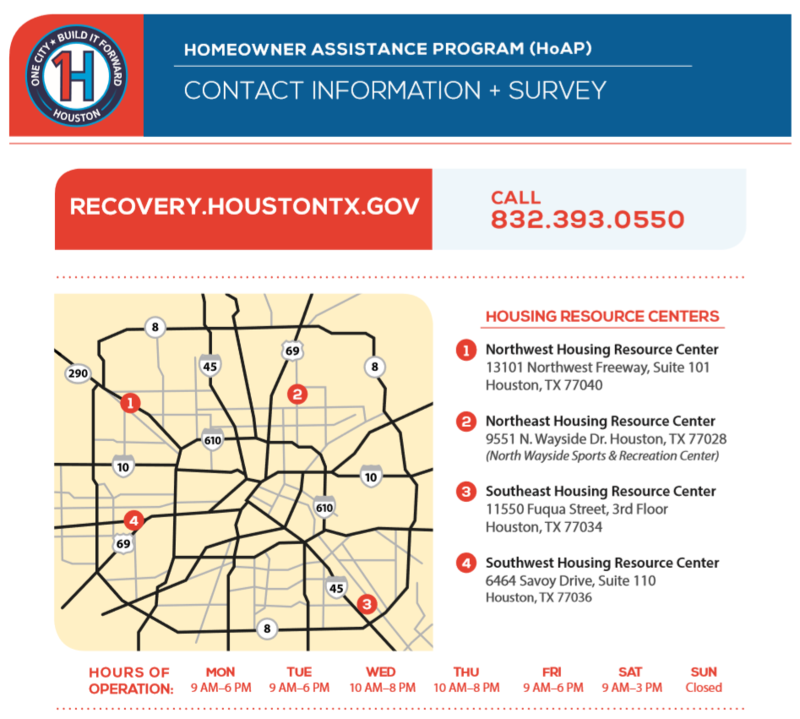 January 15, 2019 -- The City has taken a critical step forward with the opening of four Housing Resource Centers, one in each quadrant of the city, to use $1.17 billion in federal aid to assist Houstonians whose homes were damaged by Hurricane Harvey. Or in person at any of the new centers (Northeast, 9551 N. Wayside, Houston 77028; Northwest, 13101 Northwest Freeway [Hwy. 290], Suite 101, Houston 77040; Southwest, 6464 Savoy Drive, Suite 110, Houston 77036; Southeast, 11550 Fuqua St., 3rd floor, Houston 77036). Mobile outreach teams are also available to serve home-bound residents and others. Please see the info flyer (.png). Mayor Sylvester Turner opened the Northeast center on Monday, encouraging community members to be ambassadors for the recovery effort to ensure that no eligible homeowner is left out. The City will receive the $1.17 billion for housing recovery through the U.S. Department of Housing and Urban Development and the State of Texas General Land Office. The recovery funds include the Homeowner Assistance Program, which offers five program options including: 1) reimbursement for completed repairs, 2) homeowner-managed rehabilitation, 3) city-managed rehabilitation and reconstruction, 4) buyouts, and 5) interim mortgage assistance. While priority will be given to low- and moderate-income homeowners, assistance is available to homeowners of all income levels.